You love riding bikes and we love insuring them! We want to help you spend as much time as possible riding on the open road by doing all the work of pricing your motorcycle insurance for you. Because we are independent insurance agents, we look at a variety of policies and insurance carriers to help you find the best match of coverage for your needs. Between them, we can cover most legal bikes on the road! We’ll find a bike insurance policy covering the things which are most important to you. Total protection for your bike, including policies which will cover replacement costs on parts without depreciation. Our bike insurance can get your bike back to its pre-loss state. Or, if you’re newer bike is totaled, we have carriers who will cover replacement costs on a new motorcycle (minus the deductible). We also have carriers who will cover nonfactory installed upgrades to your bike, like chrome, custom paint, permanently installed electrical equipment, and permanently installed accessories (some limits may apply). You can also get insurance protection in case of theft. Total protection for the rider. We hope you ride safely, but if the worst happens and you are in an accident, we want to make sure you’re covered. 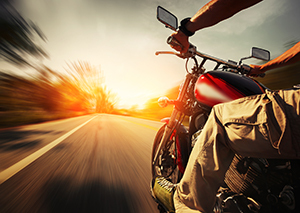 Motorcycle insurance can cover any expenses if you’re injured in an accident. Insure your gear. If your accessories or belongings are lost, damaged, or stolen, we have carriers to cover that, too. This can include helmets, bags, camping equipment, and even your phone. Coverage for others involved. Just in case an accident includes other people or drivers, our carrier’s motorcycle insurance coverage can make sure financial woes aren’t part of your concerns. Coverage for your trip. If your bike has a mechanical or electrical breakdown while your on a trip, we have carriers who will cover expenses like lodging, meals, and transportation. You can get discounts if you have multiple insurance policies or own multiple motorcycles. Call Chastain Otis today or request a free quote to get started on your motorcycle insurance today!